After many days of uncertainty finally a deal has been made between the Troika and Cyprus. 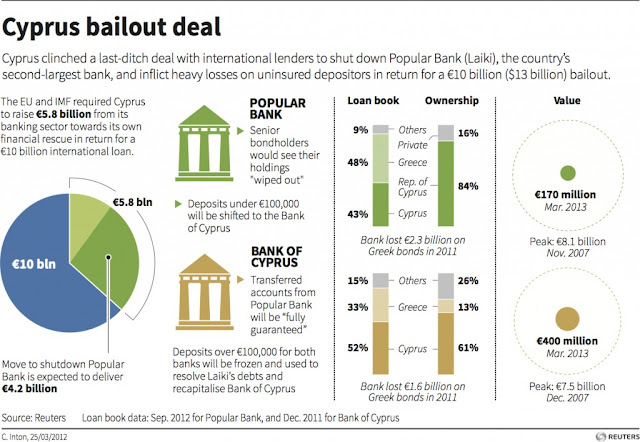 The island was required to raise 5.8 billion euro's (bail-in), when Europe would contribute 10 billion (bailout) to save the banks in Cyprus hit by huge losses incurred on Greek assets. In this deal Laiki bank was agreed to shut down, which means that Senior bondholders and savers over 100.000 (also for Bank of Cyprus deposit holders) are seized by the government.